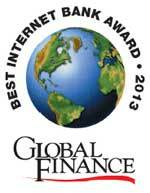 NEW YORK, July 23, 2013 – Global Finance has announced the First Round winners in the “World’s Best Internet Banks” competition in Latin America. This is the 14th year Global Finance has named the World’s Best Internet Banks. Details on all First Round winners will be published in the September issue. First Round winners include Best Corporate/Institutional Internet Banks and Best Consumer Internet Banks at the country level. Winners were also selected in Asia, North America, Europe, CEE and Middle East/Africa. The Regional and Global winners for these categories will be announced at an Awards Ceremony in New York City in November and published in the December issue of Global Finance . Also announced were Regional winners in Sub-Categories. Global winners in the Sub-Categories will also be announced at the Awards Ceremony and in the December issue. The list of First Round winners follows. Winning banks were selected based on the following criteria: strength of strategy for attracting and servicing online customers, success in getting clients to use web offerings, growth of online customers, breadth of product offerings, evidence of tangible benefits gained from Internet initiatives, and web site design and functionality. Category winners, such as “best in social media” were selected based on the relative strength and success of those web products and services.